There were more trails to do that make up the greater Kumano Kodo pilgrimage, but I was keen to begin the next part of my trip that didn’t involve hiking quite so much. After spending around a week in Kumano-Hongu Taisha over the New-year period I decided to make my way to Osaka around Jan 3rd. I felt during the hike I had captured a particularly special moment. The trail was so quiet, perhaps I was lucky, perhaps its rare for people to hike in the winter. Either way I think it would be a entirely different experience later in the year. I had been extremely lucky with good weather, and as is often my way, general good fortune. Deciding that completing the 70km Kohechi Trail route was enough for this occasion. Finishing that off is for next time, I left the comfort of Cafe Bonheur and took myself down to the bus station. As the sunrose we wound our way out of the mountains of Wakayama Prefecture to Tanabe, then a swift train through to Osaka. Out the mountains and into the city. I felt as if I had been away for a lifetime. I could of stayed a lifetime. The Wakayama area is pretty special. Osaka had a very different atmosphere from Tokyo. Much more relaxed, although still a city of 2.665 million people. 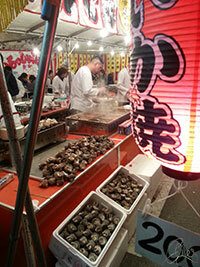 I spent about 3 weeks in Osaka and it was very interesting. The bicycle culture was very healthy, bikes everywhere. And they had this really cool locking system, a device is located on the back wheel and when parked you push a bar through wheel it ejects a key and the bike is immobilized. Nae problems. Funny the little things you notice. I enjoy cycling around, you can cover a lot more ground and this gives you access to exploring places I think would otherwise be missed. What struck me was the cars seemed to be overly careful to give bikes space and priority at crossings. This was unusual enough, but the bikes had free reign on going up & down whatever street in whatever direction. As long as they were at the side, this seemed to be okay. Not really safe, I didn’t see any accidents surprisingly. There was a million boutiques selling everything you could imagine. Heaps of vintage clothes places, some good gear but fantastically overpriced. Especially old trainers and shoes. On the flip side the record stores were so good I just stopped going into them. It was all too amazing. Everything was in mint condition, each sleeve not a dent or a crease. Japanese people must really look after things. And the prices were cheap. I had to get out, if I couldn’t walk away from one then the gates would be open and I’d want them all. But that didnt stop me indulging in the Vinyl while I was there…. I just had to keep it to the bars.. I found some awesome Jazz bars, to be honest I didn’t think places like this still existed, or if they indeed ever did exist outside of a beatnik novel from the 50’s. Tiny joints. Dusty and dark. Old racks of vinyl stacked from the floor to the low ceiling. Literally thousands of records. An accumulation of objects built up over the years crammed into this tiny space, its the kind of interior that only happens over 50yrs plus of growth. Its random, but its not.. it all just works. Old bar, old bartender in a equally old hat. Smoking and changing the record at each side. Old stickers scratched off the sides of dim lamps. Ragged edged posters of old movie stars, concert & album posters of Jazz musicians. When you step into bars like that, as the door shuts behind you so ends the entire concept of an outside world. The concept of an outside time. After some drinks, after a chapter in a book, when enough sides of records have gone through their set of songs, at some point you stand yourself up and open the door leaving 1959 as it was. Time lost in these places is special time. I explored a lot, walking and cycling to random areas. I particularly enjoy more residential areas, see what a place is really like and whats happening on a regular Tuesday morning, or being right in the middle of the morning or evening rush hour. Its just fun to be watching the gears of a city in full action. My main agenda was to visit my next Higashiyama Kaii Gallery located 220km away in the Kagawa Prefecture near a town called Sakaide. Famous for its oranges. 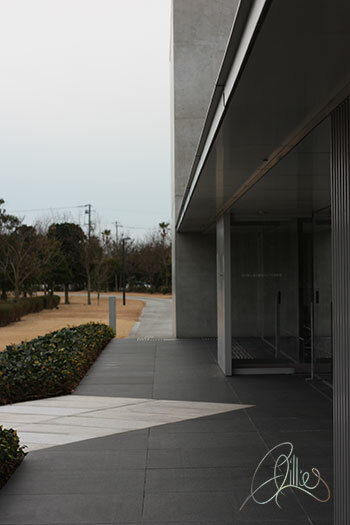 香川県立東山魁夷せとうち美術館 was my second Kaii Gallery. It was a long way to travel from Osaka but worth the journey. I arrived in the small town in the afternoon after some very fast train travel, expensive but given the journey time, justified. Again I took note of the exceptional leg room on your average train in Japan, far cry from the cattle cars suffering of UK rail travel. This gallery was very quiet looking, from a distance it just looked closed, austere even. A warm welcome to be found though. I had a look round perhaps 3 times, just trying to take in each picture. I would of liked to have taken some photos of the actual space, it was a very nicely designed gallery. Not very big, although everything on display was excellent. No filler. In the cafe I met a couple. A woman has taken her mother to an eye operation and after the mother had wanted to come somewhere peaceful. So this is where they had come. 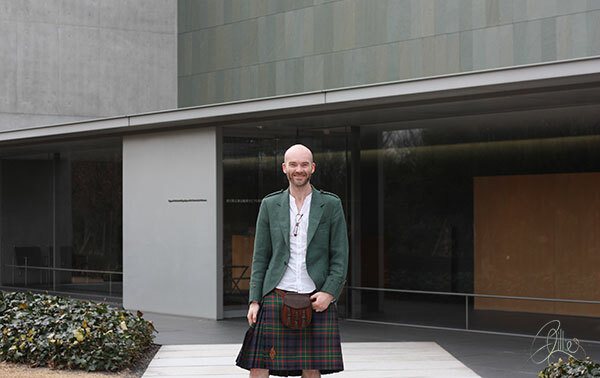 The mother had never met anyone from Scotland, wearing the Kilt you become something of a cultural ambassador which I find pretty cool. All of the Japanese people I met asked the same question, why I had come to Japan? I explained my interest in Higashiyama and in Art in general. They told me about another big gallery in the next town, if I had time I should probably visit. We parted ways and I went for another walk round the gallery. When I left they had come back to say they would like to offer me a lift to the other gallery, and they gave me some local oranges. 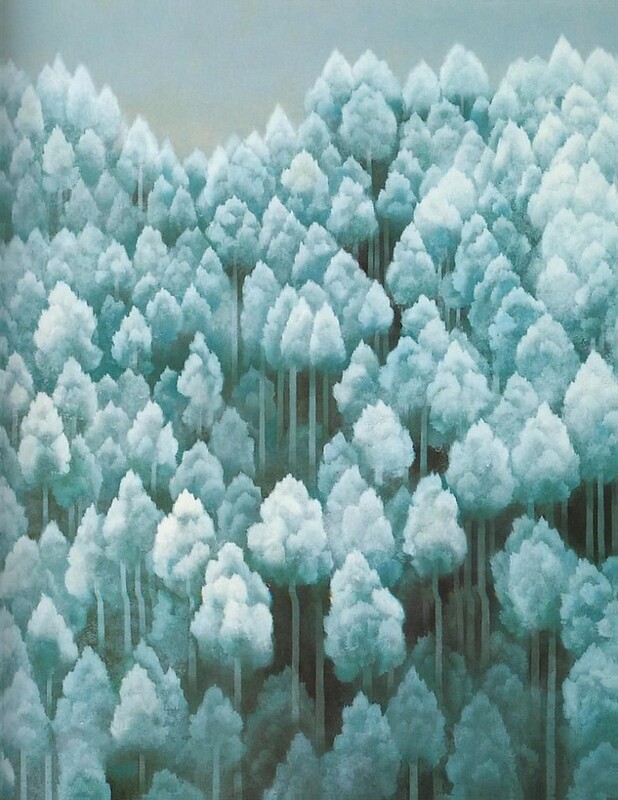 I can’t really review the Higashiyama work on display, I didn’t take photos in the gallery and I wouldn’t share them if I did. I would say that seeing these works in real life was infinitely more embracing than seeing them in a book. Im not sure I had a favorite at this gallery, it was just so amazing to see the pictures in real life, real size. Even seeing the frames, the dimensions of the actual pictures I find so interesting. It was hard to walk away. This is one of his paintings, I can’t remember if this was displayed at this gallery or not, I saw it at one of them.. either way just wanted to share an example of his work if you were curious. 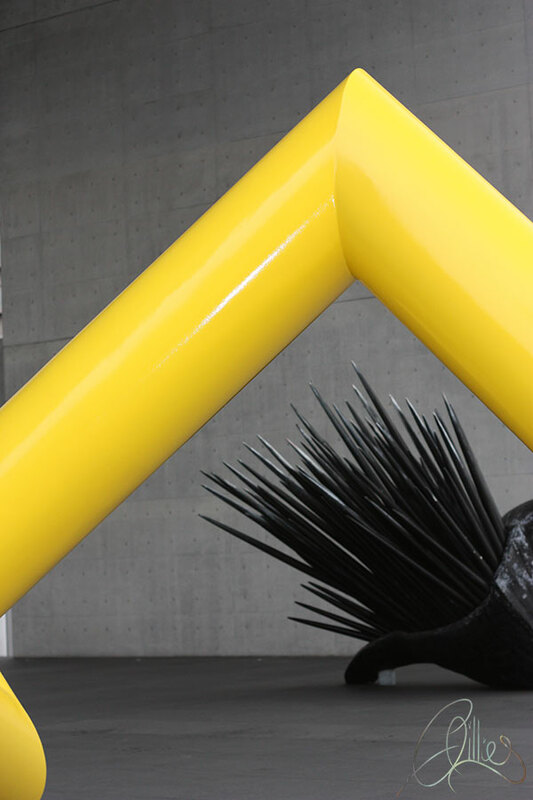 So I unexpectedly found myself in The MIMOCA, Marugame Genichiro-Inokuma Museum of Contemporary Art. 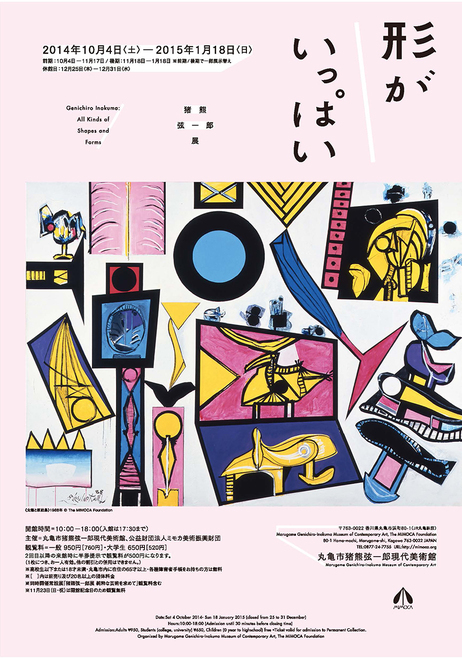 The special exhibition at this time was ‘Genichiro Inokuma: All Kinds of Shapes and Forms’ and although not the kind of art I take time to look at I did enjoy the show. The gallery building itself was very cool with a number of awesome sculptures outside it. 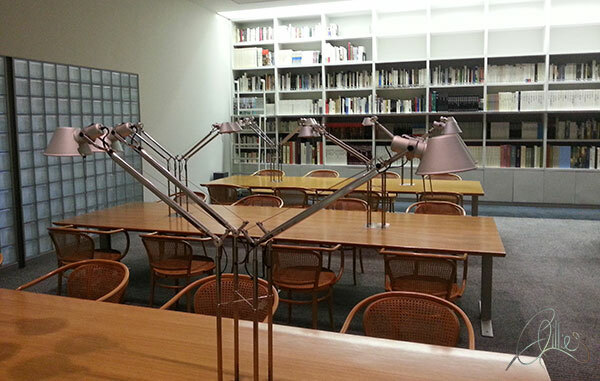 I really enjoyed peaking my head in the museum’s library room. Desks fitted with these beautiful metal lamps, it all looked really stylish but totally considered. They also had a creative space for children and were also holding an exhibition of work, or perhaps it was a competition, by what looked like differnt age groups or school classes. 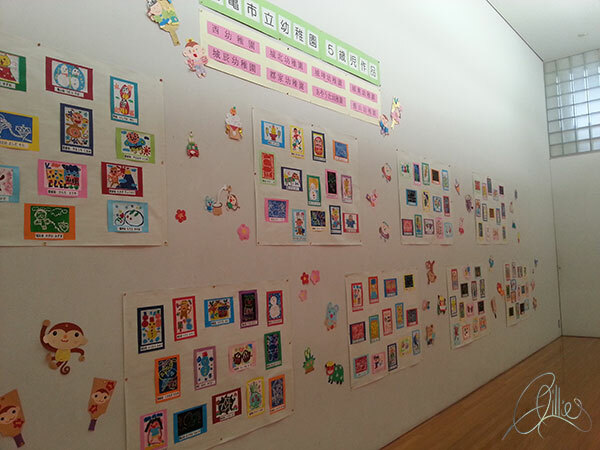 Anyways it was nice to see the space being given over to the kids in a main gallery. 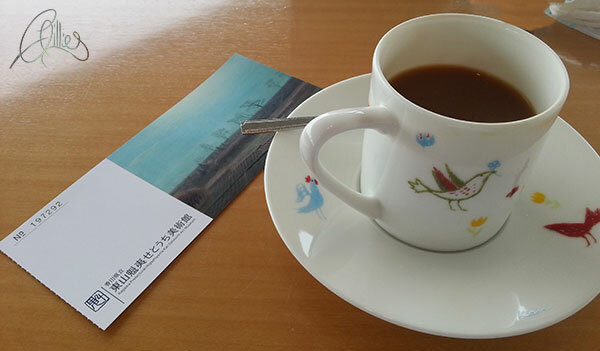 When I had my fill of art I took the train back eastwards to Osaka. Even this was kinda fun, the first part of the journey was by local train, it stopped everywhere and took ages. But this meant I got a chance to just see regular folk, finishing work or school, heading home or heading to work. People seem pretty comfortable with just going to sleep on the trains. Those that weren’t asleep were locked into phones. Games or comics seemed to be the main preoccupation. 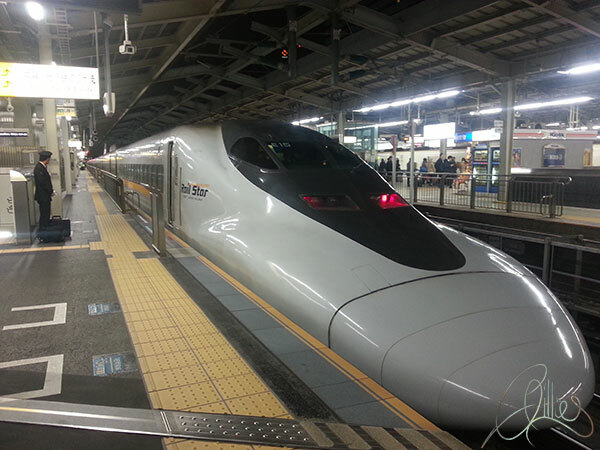 The second part of the journey was by express train and I was back in Osaka by night. These trains are in every way as cool as they look. Completely efficient, clean and comfortable. The passengers on all the trains and buses I took really upheld this unspoken standard behaviour of social conduct. There is a way to board the train, there is allocated seats. There is silence on the train. All organised. Makes me wonder what a Japanese person would think about the last train out of Inverness to Elgin on a Friday night in all its mental chaos. 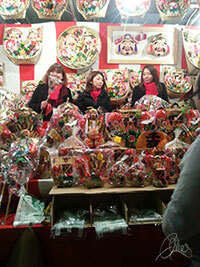 While I was in Osaka I also got to experience a three-day festival dedicated to Ebisu, the god of business and prosperity at Imamiya Ebisu Shrine in Osaka. (lets see if any of that rubs off) Featuring a procession of women in colorful kimono carried on floats through the main streets. 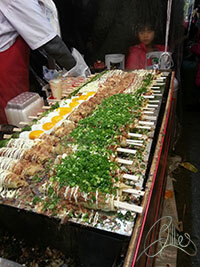 The night I went along I spent a couple hours lost in an insane food market. Some of the stands were a little extreme in size, and the construction seemed to be mostly bamboo poles bound together by twine. Structurally safe? Nae chance. Totally overcrowded, fire hazards in every direction. It was pretty chaotic, but everyone seemed to be enjoying it. I was keen to find the art scene in Osaka, eventually I clued into an opening of a group show by SenseO in a pretty hip space called Pine Brooklyn, which was as totally hipster as it sounds, but made for a good exhibition venue. I was surprised how many white people there were there, it seemed as if I had opened a secret door to the white people hide out. And can’t say I wanted to stay. Loud obnoxious americans were the order of the day, but aside from that the artwork on display was really good, the whole exhibit event as an evening was excellent. Id like to take some of those elements into a show back home, my overall feeling was really need to raise our game. Over the course of the night there was art to view, a minimalist performance between a trumpeter and a ghost dancer, a set by a band called ‘King’ with a pretty extravagant front man, video displayed, a live paint performance between 2 drummers a DJ and an artist doing a huge wall mural, very intense. I really enjoyed the live paint, i’ve been trying to imagine myself doing something like that. Im not sure what kind of music I would have, I think either minimal folky ambience or jazz, somehow peppered with mental noise. I can paint fast, but to take it down into under an hour long performance would be interesting, as well as the unplanned play between the visual and the audio. Anyways something I would really like to try. 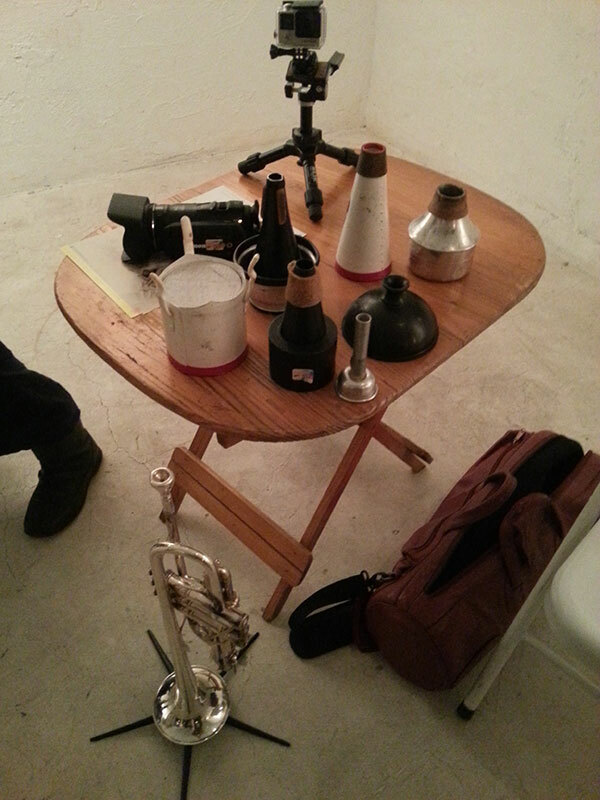 Table of experimental Jazz goodies. ‘King’ Very cool band, awesome costumes. Kimono and guitar is a very cool mix. 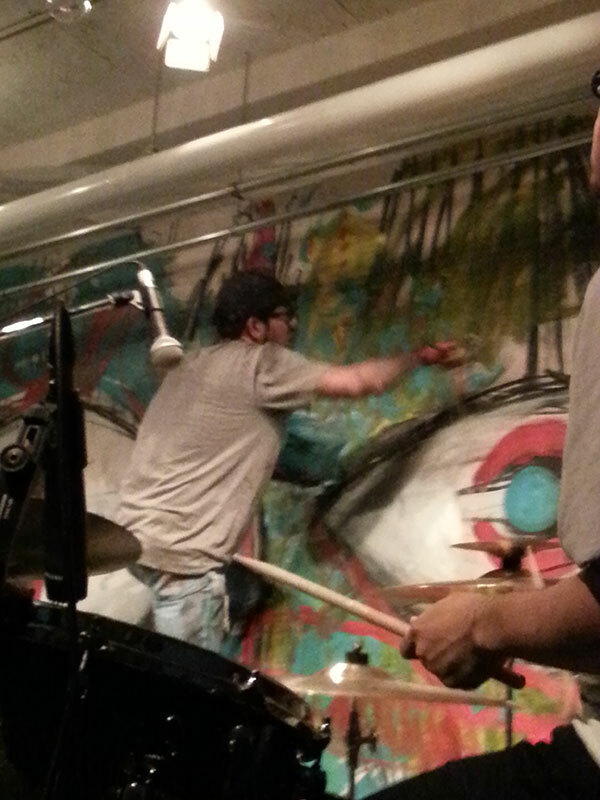 Live art performance, with two drummers a DJ and 1 artist working on the back stage wall. 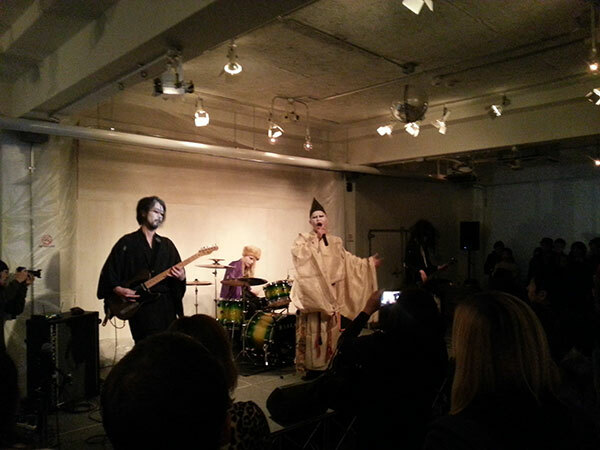 The whole thing took about an hour, I was surprised how engaging the performance was. I thought the drums would of become monotonous pretty quick, but the build up of the set was impressive. If you’re interested in other photos they are available here. So after a couple weeks in Osaka I made my way to the next stage which was to be Kyoto. On a final note it became clear to me that Osaka is living in the mid 90’s, no bad thing like. I heard a lot of Oasis in particular, like a LOT! The Osaka people really like the 90’s I guess, there did seem to be a wee touch of the grunge appearance in the Osaka youth. It was nice to hear the tunes again…. Sadly the one time I did find a funk night I was the only one there. Im not one to let an empty dancefloor stop me from having fun so it wasnt a problem. 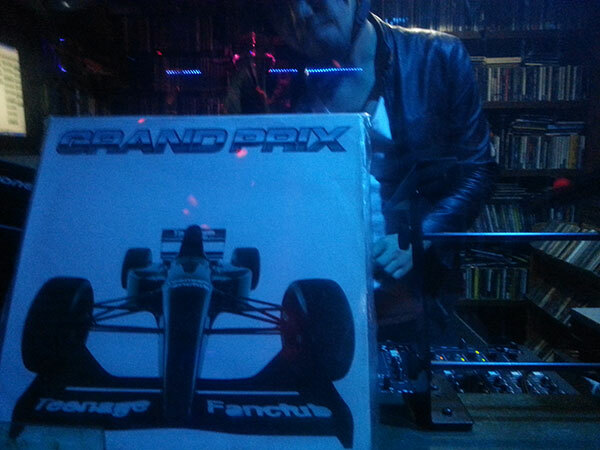 The funk is hard to find in Osaka, does it exist at all?…..